It’s not that uncommon for twins to be born on different days, but not too many twins can say that they were born in different years. The Bear twins can. 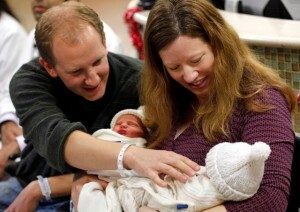 Jenna, born at 6 pounds, 15 ounces was born at 11:59 on New Year’s Eve. Leah was born at 6 pounds, 4 ounces and she was born as the clock struck midnight on New Year’s Day. Father, Blake Bear, just says that he is happy that the twins are healthy. In just a few more days, the twins will head home to join their 18-month-old sister, Natalie. But the family isn’t alone in their celebration. Attending physician, Kiran Rao, said that this is his first New Year’s delivery. He usually works Christmas. Rao also stated that things might have gone differently if Leah hadn’t been breech. “It’s just a happy coincidence. If Leah had been head first, they would have gotten two tax write-offs instead of one,” he said. So was the birth timed? Rao says he had given it some thought, but that was about it. “We just went about our business and it all kind of fell into place,” he stated. Planned or not, the Bear family is very happy to have the wonderful new additions to their family. Jocelyn says she can already see the difference in the girls. She says that Jenna is “a little calmer” than her baby sister Leah and Jenna’s cheeks are definitely chubbier. “I guess now we’re the five Bears,” she added. Congratulations to the Bear family as they ring in the New Year with their beautiful baby girls! Canadian Mom Welcomes 2 New Years Babies In A Row!